Home > News > Archive [< 2012] > StarForce presents new products! 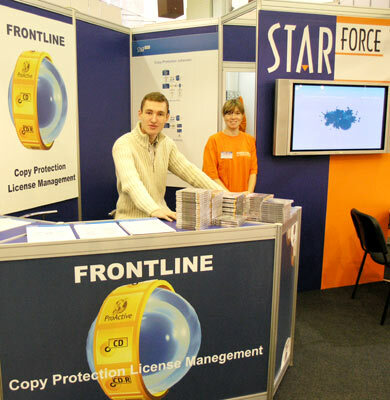 StarForce Technologies took part in SofTool 2006 – a major Russian IT exhibition, where company presented new versions of StarForce Frontline and Safe’n’Sec. New Safe’n’Sec Personal 2.5 version for home PC protection from S.N.Safe&Software was presented at StarForce stand. The novelty differs from its 2.1 predecessor for maximum simplicity and usability. 2.5 version has got User assistant similar to the one Windows OS users has got used to which helps user to install and set Safe’n’Sec correctly for further comfortable and efficient use. User assistant is also helpful for correct Safe’n’Sec activation and after that offers user initial OS scanning for malware presence and its deleting from the PC, making the list of trusted applications for further false alarms minimization, etc. User interface has also been significantly changed for the same usability purpose. Besides malware detection and blocking system in Safe’n’Sec Personal+Antivirus 2.5 version has been supplemented with the module of a process pre-scanning for known viruses presence before this process start up. 2.5 version security system has also been supplemented with options of additional malware interception which previous Safe’n’Sec versions failed to block. During the fair StarForce stand visitors had a chance to ask Safe’n’Sec developers specific technical questions and also participate in “Kill the virus!” Super game and win special Safe’n’Sec prizes. All exhibition days StarForce stand was full of enthusiastic players and almost everybody has got Safe’n’Sec presents. Funny “Kill the virus!” game contributed much to Safe’n’Sec software popularization among end users. StarForce SDK for protection against illegal usage was also at peak of attention with its three new versions. The new platforms comply with any software, games, business applications and online products. FL Corporate is a tool for protection of business applications within local networks. The protected product can be used simultaneously by several users. The number of users is limited by the number of purchased licenses. Users can run the protected application from any workstation within the company. This allows to save funds because licenses are sold per user instead of per workstations..
FrontLine Universal is a solution for protection against illegal usage and industrial and home piracy. It combines one time integration and multiple ways for distribution. Protected products can be distributed on optical media or over the internet. Protection includes a full spectrum of modern DRM services. In addition to that FrontLine Universal allows making of back-up copies for end-users. A totally new product in the FrontLine family is – FrontLine Mobile. It is an optimal solution for protection of mobile content. It provides a full spectrum of DRM options for mobiles and smartphones that support JAVA and/or Symbian OS. Mobile solutions for other platforms will be released shortly. StarForce also present a new solution for protection of pdf, html, doc, ppt. The upcoming versions will support protection of audio and video files in most popular formats. During the expo StarForce hosted traditional anti-piracy event. The leading Russian game publishers such as 1C, Akkela and Russobit-M in cooperation with StarForce provided approximately a thousand CDs with games which were exchanged for several thousand pirated CDs of various content. 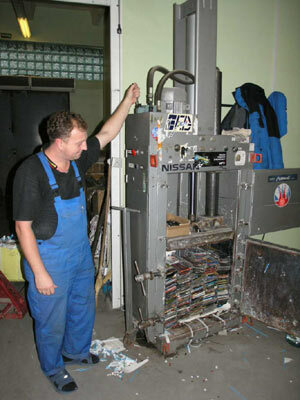 After the exhibition the discs were destroyed. This was a rare case when pirated CDs were voluntarily surrendered opposed to being officially withdrawn by authorities. StarForce Technologies one of the world’s leaders in copy protection will continue such actions on regular basis to evolve the habit of using licensed products. All in all SofTool2006 was a success and StarForce has already applied for a bigger stand next year!